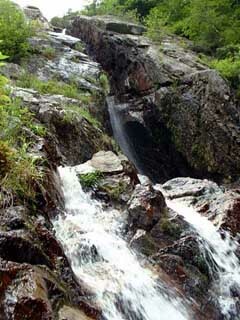 Barnum Brook trickles down over ancient rocks on a trail at the Adirondack Visitor Center in Paul Smiths. 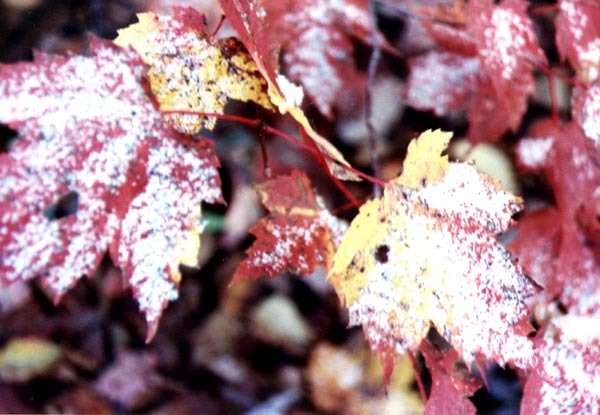 Frosts come early to the High Peaks (near Saranac Lake). The best time to see fall foliage is late September to early October. The Olympic Center in Lake Placid, the home to "The Miracle on Ice" in the 1980 Winter Games. 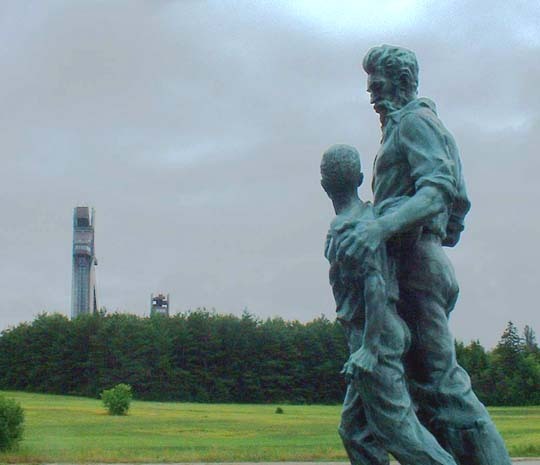 A statue of John Brown stands at his homestead outside Lake Placid. The controversial abolitionist warrior is buried here. Lower Cascade Lake reflects nearby mountains on the road between Lake Placid and Keene. Roaring Brook Falls is just a short hike from Route 9N, just south of St. Huberts. 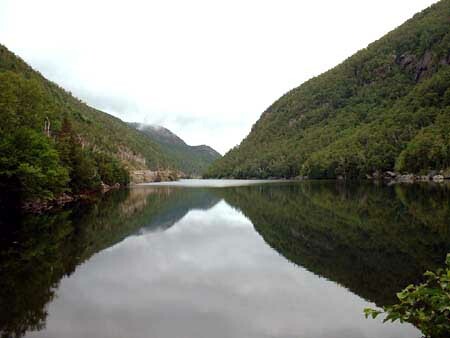 Wilmington Notch is a narrow valley carved by water and glacial erosion along Route 86. 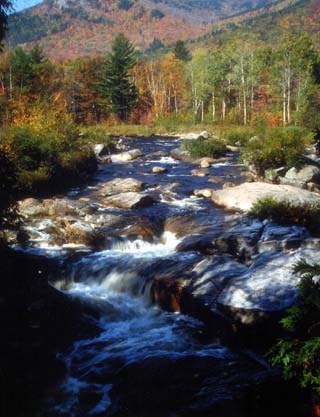 The Ausable River tumbles through many small falls and rapids along this route. 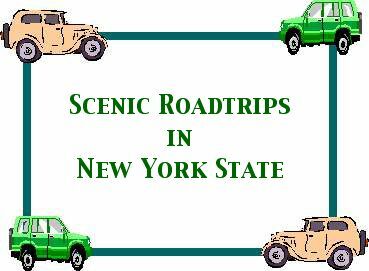 A scenic road trip through the High Peaks of the Adirondacks, including Saranac Lake and Lake Placid. You can't make a mistake in the Empire State! 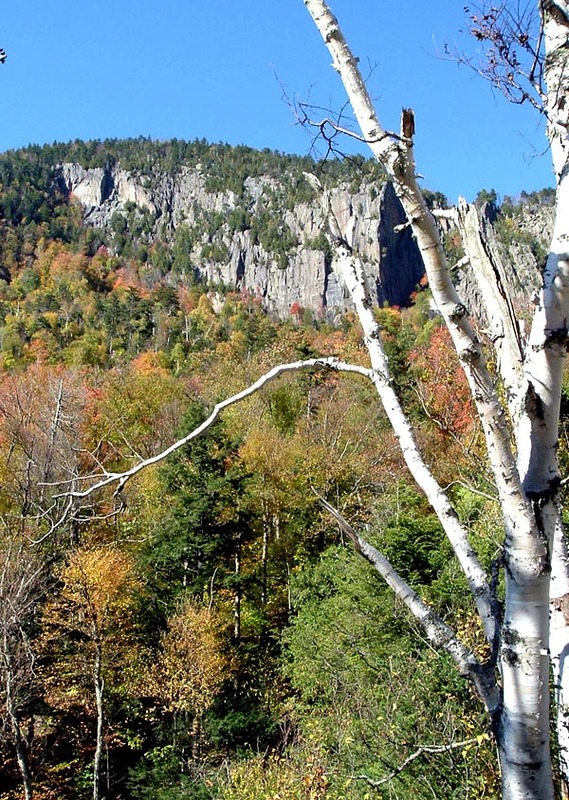 The High Peaks of the Adirondacks are certainly scenic gems, wilderness areas just a day's drive from New York City and most of the rest of the state. Of course, you don't want to rush through this road trip. There is so much wonderful scenery to see, no matter what time of the year (although autumn is especially spectacular). Along this route there is the opportunity to get out and see the mountains up close and personal (which is a prerequisite for a geographer). 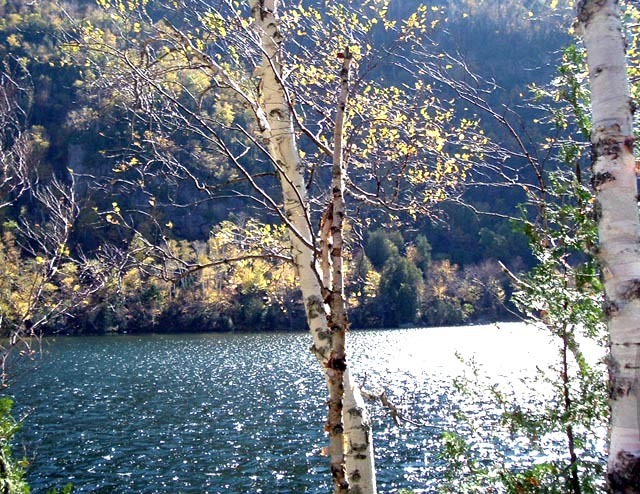 You will learn about the natural history of the Adirondacks at the Visitor Center in Paul Smiths. You can shop for mountain crafts in Lake Placid and Saranac Lake. 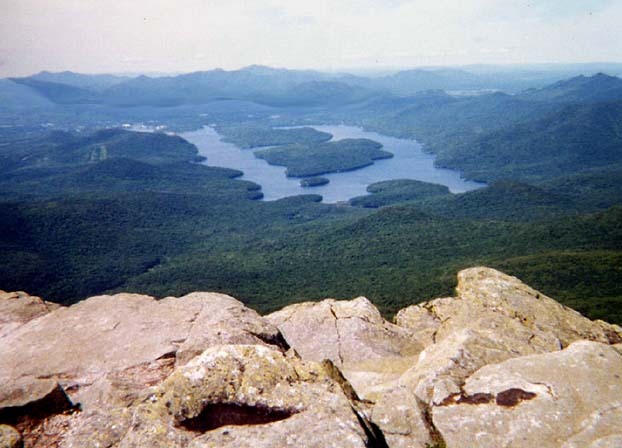 And you will enjoy one of the most awesome vistas in the Northeast from the top of Whiteface Mountain. Get moving. The mountains are calling your name! 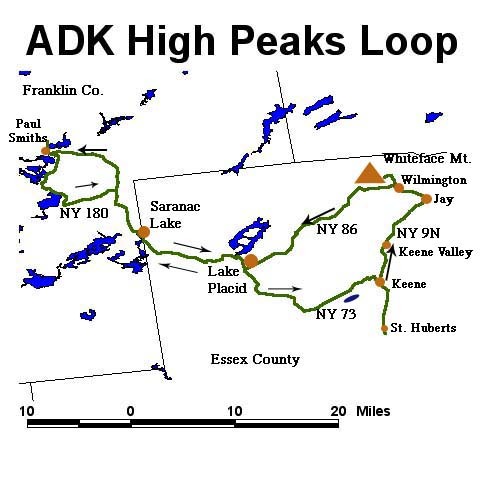 The trip through the High Peaks will begin and end in the "hub" village of Saranac Lake. In the late 1800s, this little town was home to hundreds of tuberculosis patients hoping for a mountain cure. 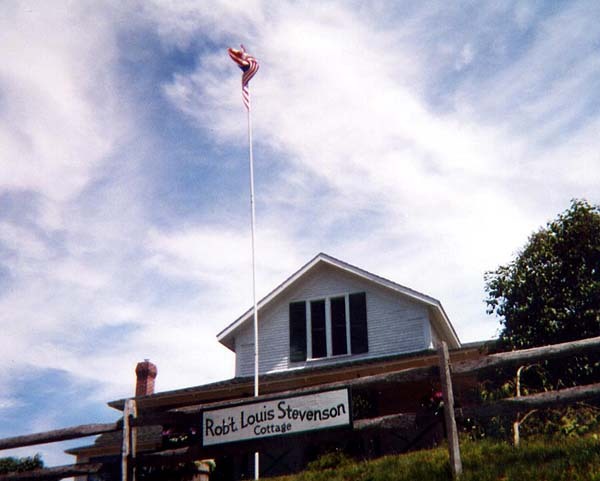 One on them was the author Rober Louis Stevenson, and you can visit his cottage on the edge of town (photo on left). Take Rte. 86 north and get ready for some great views of the mountains off on your right! Shortly you will arrive in the little college town of Paul Smiths. Just north of town is the Adirondack Visitor Center. You should stop, see a video production and then hike one of the trails maintained by the Center. When you leave stay on Rte. 30 heading south. 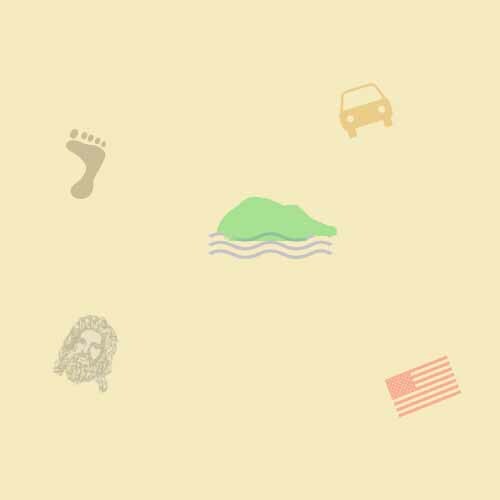 This will take you through some of the most beautiful mountain lakes in the East. When the road intersects with Rte 3, turn left and return to Saranac Lake. Take Rte. 86 again, only this time head east for Lake Placid. 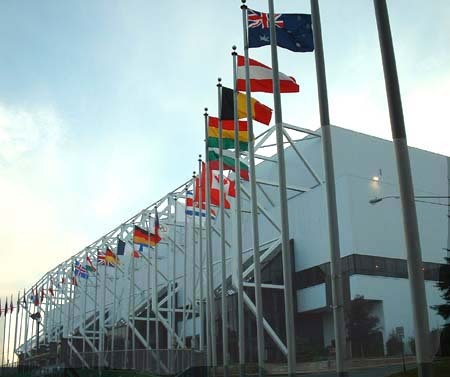 Take time to stroll the business section and perhaps see an event at the Olympic Center. Drive out of town on Rte. 73. Watch for signs for John Brown's Farm. This is final resting place for the man some say started the Civil War. Get back on Rte. 73. You will pass a couple venues of the 1980 Winter Games, which are still very much in use. Maybe you might want to ride the bobsled? The road continues eastward into a very narrow valley filled with the two Cascade Lakes (see photos on both the left and the right). This is a great spot for picnicking, fishing and boating. When you leave the picnic area, be careful, since traffic might not see you. Then you can safely proceed down a long incline into the Keene Valley. Turn right at the intersection in Keene. (Stay on Rte. 73). 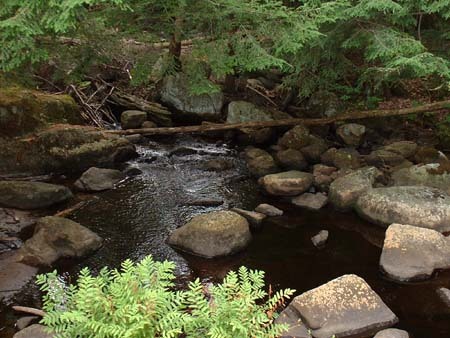 After you pass through little St. Huberts, watch for the parking area for Roaring Brook Falls. This is a very pretty and easy hike. The forest and the waterfall are worth the stop (trust me!). Retrace your steps back to Keene Valley. Stop at the Noon Mark Restaurant for a piece of their homemade pie. Then take Rte. 9N north through Keene and Jay. Turn left on to Rte. 86 west and follow it to Wilmington. Just outside the village is the road to both the North Pole and the incredible Whiteface Memorial Highway. You haven't seen the Adirondacks until you've been to the top of Whiteface! (see photo on the left). On a clear day you can see Vermont. And it's great fun to walk through an alpine tundra. After returning to Wilmington, take Route 86 back toward Lake Placid. The trip is not over! The road passes through Wilmington Notch along the Ausable River. Here you will find the Whiteface Ski Center and the High Falls Trail. These are also recommended stops on your grand tour. Route 86 soon returns you to Lake Placid Village and Saranac Lake is around 9 miles further. Great places to go to see New York Geography up close and personal.